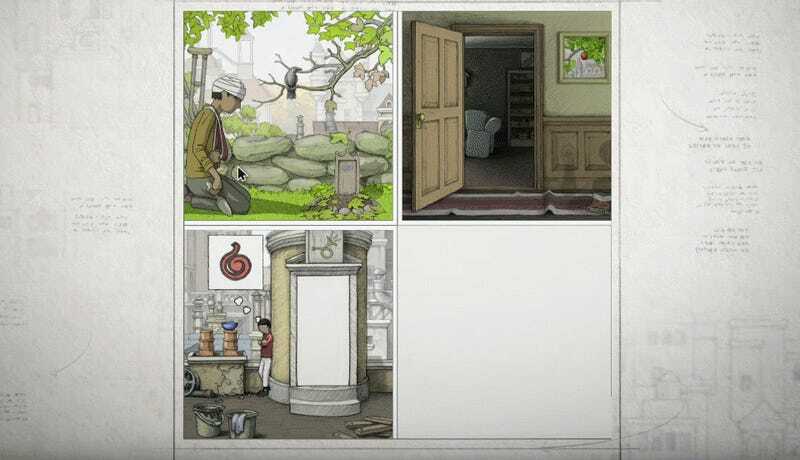 Designed and drawn by Roberts, Gorogoa tells a story whose action is driven by the way you manipulate pictures to reveal strange connections. It’s a game that’s intended to be devoid of language, focusing instead on individual scenes and how they can be mixed together using an interface with drag-able tiles. In an interview several years ago, Roberts said he decided to make the title of the game a nonexistent word to emphasize the priority of imagery in the game. Roberts recently told Polygon that the game’s development has taken so long in part because he grew alongside it. As his own artistic abilities improved, he looked to go back and improve upon the work he had already completed. Joel Corelitz provided the music for the game, but the rest of the project is a one-man adventure. Originally slated only for release on PC, the game is now also planned for iOS and Android later on. You can see more of the game’s spectacular art below.